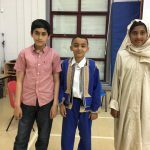 Members of Year 5 took part in a special assembly to speak about Ramadan and Eid. Fathima had some wonderful knowledge and Adam shared his experiences. Well done, Eid Mubarak!